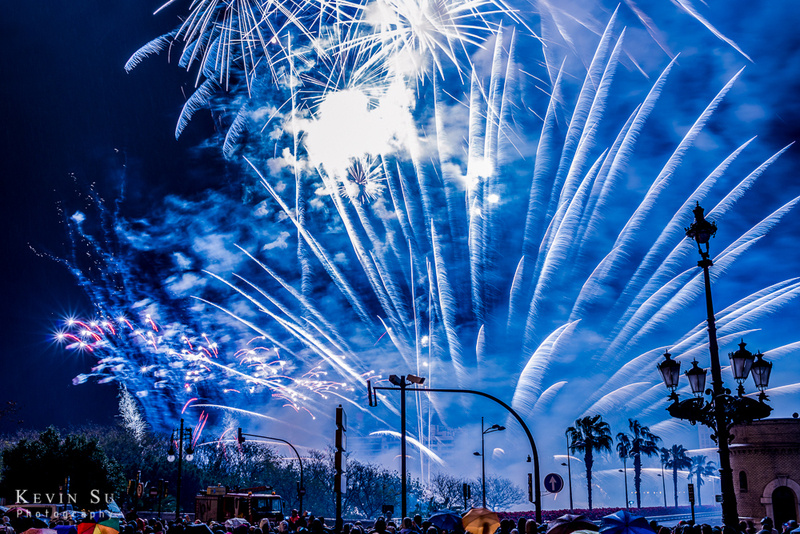 Through the syncopated drumming of deafening firecrackers in the Plaza Ayutamiento, standing shoulder to shoulder in the thick crowd of excited Valencians and smoke, I was immersed in the spirit of The Spanish fiesta. On March 14th, I went to experience 6 days one of the most rich, sensational and luscious festivals that I have ever attended: Las Fallas. 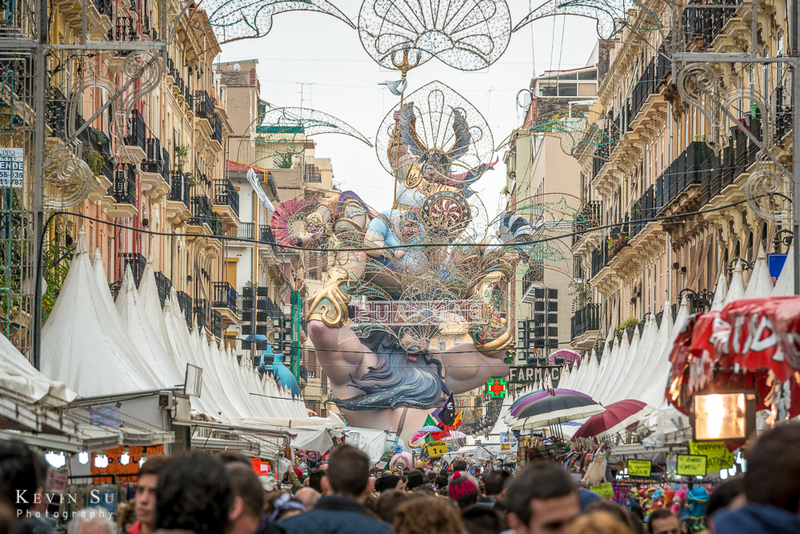 Erected in the coastal city of Valencia, home of the famous dish “Paella”, Las Fallas, has been quietly attracting thousands of visitors for generations. This flamboyant Spanish fiesta had it all: with large scale art pieces scattered throughout the city, traditional costumes, street performances, fireworks, religious processions, firecrackers, street food, traditional music, art, all culminating to a climatic night called la Crema when the city would be engulfed in a night of fire and ceremonial burning. This concept of burning large structures of elaborate artwork may seem like a new age “burning man” idea, but in fact this festival dates back to the middle ages. During the spring, artisans and carpenters would gather their broken artifacts and scraps, build them into figures, dress them up with fabrics and then burn them. 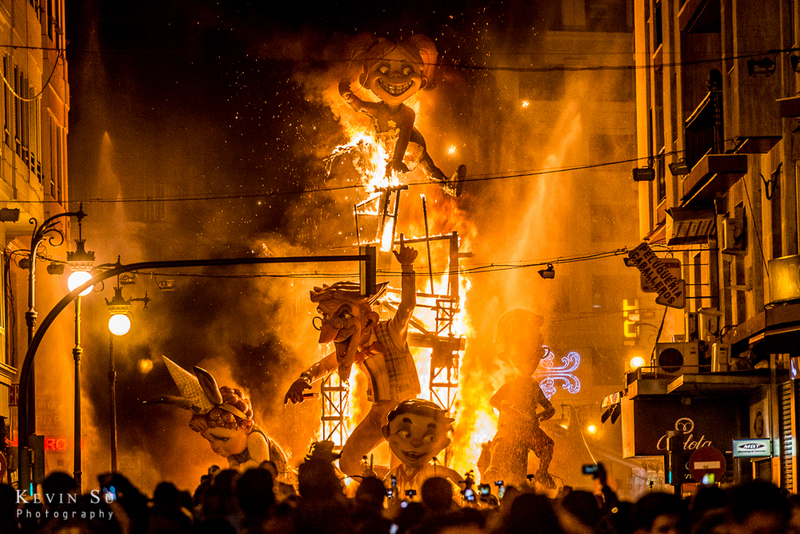 It became a tradition to burn these structures called “falles”, every spring. Over time the tradition evolved, and the falles became bigger, much more expensive and daring. 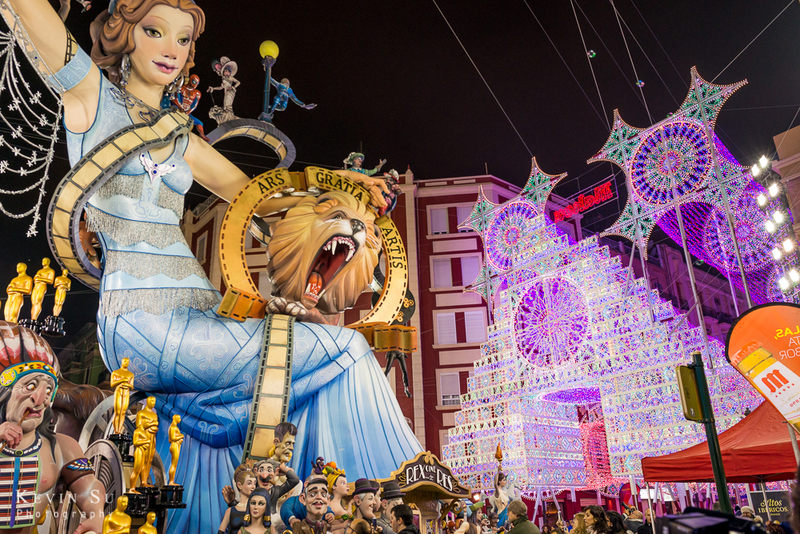 Today the falles can get up to 10-15 meters tall, are painted by master artisans, cost an upwards of 250 000 Euros and take on humorous topics and satirical views of popular culture and politics. I saw my first falle within a few meters from getting out of the train station. It was a 5-meter high portrait of an old woman with clouds coming out of her head depicting her memories of childhood and marriage. The airbrushed details on the sculpture were impressive but there was too much excitement to stay and admire as I was swept into the moving crowd. I was guided into the main plaza by the strong aromas of chorizo, bocadillo, and paella stands that lined the streets. 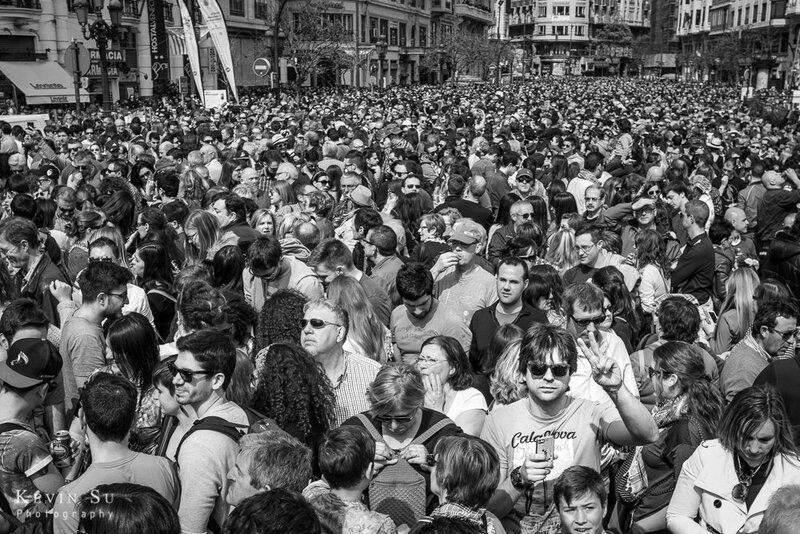 I followed the flow of people until I was surrounded by thousands of excited people all waiting for the daily Mascleta (a 15 minute bombardment of synchronized high powered firecrackers). I was offered a 1 euro cerveza by a street vendor clambering over the thick crowd. I gladly accepted the offer and watched him maneuver back into the dense crowd. No more than 30 minutes after arriving in Valencia, the deafening spectacle of La Mascleta commenced and I was thick in the middle of it. When the explosions started, I knew I was in for the experience of a lifetime, Las Fallas. I stayed in hotel El Global on the beach 30 minutes from city center. It was nice to get to a quiet part of town after a full day of excitement. My hotel was located above a strip of bars and restaurants on a pristine beach promenade. Being so far out of the busy city center allowed me to explore the smaller and lesser-visited falles of this neighborhood. There was a beautiful 5 meter high Falla of a cowboy just across the street from my hotel. I passed this Falla several times during my stay and there was always a flurry of activities happening in the neighborhood. They were often preparing community barbeques, setting up a firecracker shows or preparing their traditional clothing for a parade into town. It was the perfect vantage point to see the local activities unfold naturally, and without the crowds of the city center. 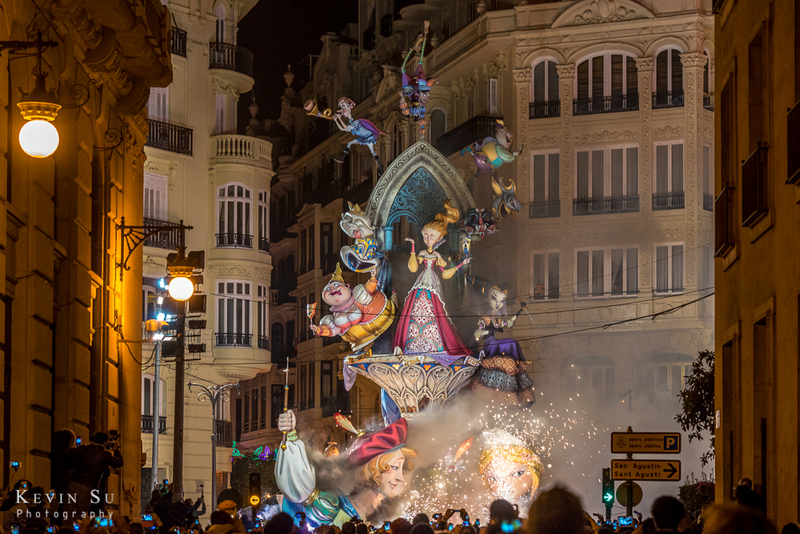 The last three days of Las Fallas was an ascending excitement of religious processions in the old city, late night firework shows and more Mascletas. The most notable procession was the “Offrena de Flors”. This exhausting procession lasted 2 days as thousands of devoted Catholics dressed in their traditional clothing, walked to the cathedral with red and white flowers. They followed a long procession through the old city and deposited their flower offerings under a large wooden falles of Virgin Mary. 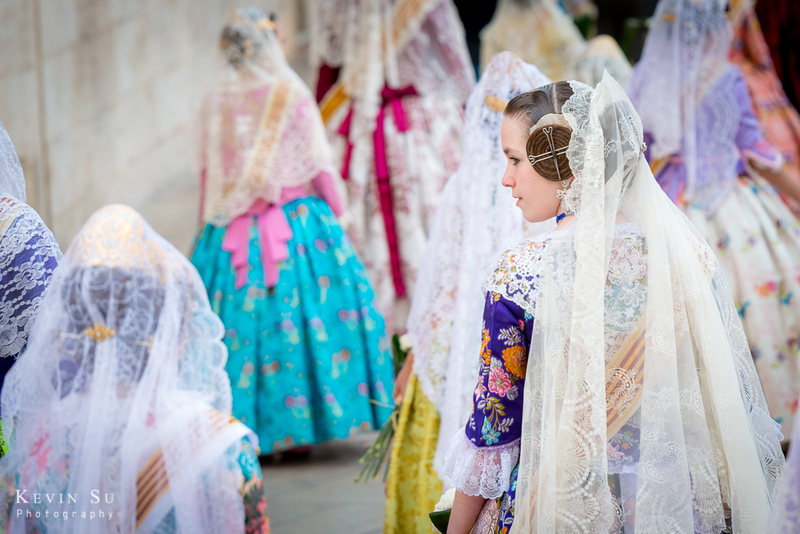 As this long procession went on for 2 days, a team of artists continuously placed the flowers on the falles to create a delicate pattern on the Virgin’s cape. It was mostly the women who stole the show during the procession. “Guapa!” meaning beautiful was shouted by admiring bystanders in the crowd cheering on these gorgeous Valencian women. The girls spent most of their day preparing their hair and makeup for this momentous occasion. As quickly as the events unfolded, the climatic burning night of la crema came all too soon. It felt as if all the excitement building up from the week could be felt throughout the city. Normally the night would have started with a big parade of fire and performance through Colon Street, but due to high winds, the firefighters called it off this year. It was to our relief though to hear that the burning of the Fallas was still going to take place. It was a tough night for the firefighters for while the rest of the city celebrated they went from falle to falle, making sure the fires were kept safe. I coordinated my night to catch the burning of 2 smaller falles and 3 major falles including the big lion in Plaza Ayutamiento. It was a blast rushing through the crowds to anticipate the next burning while all the Fallas waited for the busy firefighters. Fireworks streamed into the sky to announce each burning falle as locals danced and posed in front of hot ashes. I navigated the lively streets cutting between squares and children lighting off firecrackers and poppers. The noise, smoke and crowds roared with the fiesta in full swing. It was a merry maze chaos and celebration. 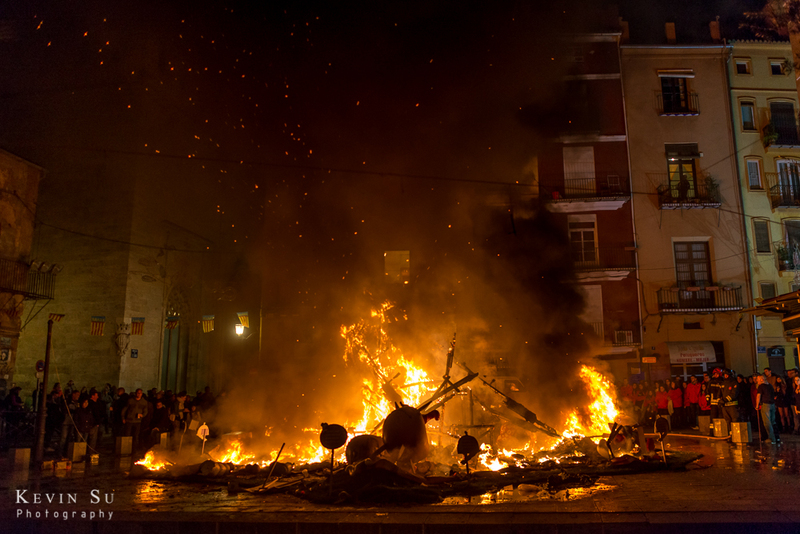 After the burning of the main Fallas in Plaza Ayutamiento there remained one last Falla to be ignited in Plaza de Doctor Collado. Following tradition this falle is always burned last. The joyful crowd gathered as the exhausted firefighters played with the heckling crowd. They knew this game all too well as the crowd teased the firefighters to spray them with their hoses. Another firework show blasted into the late night sky, a dousing of gasoline and the last Falla was sparked. The crowd watched silently as the last Falla seemed to burn forever. It was moment for us to reflect on the intense week of fun. Like the coming down of a sugar crash the excitement subsided and the fire of the Spanish fiesta calmed to a glow. It was the end of Las Fallas. As soon as the morning came the proud Valencians would wake up and start all over, preparing for the next Las Fallas fiesta!